For the enterprise users who selected Cisco 4500-E series, choosing a suitable power supply is also important. 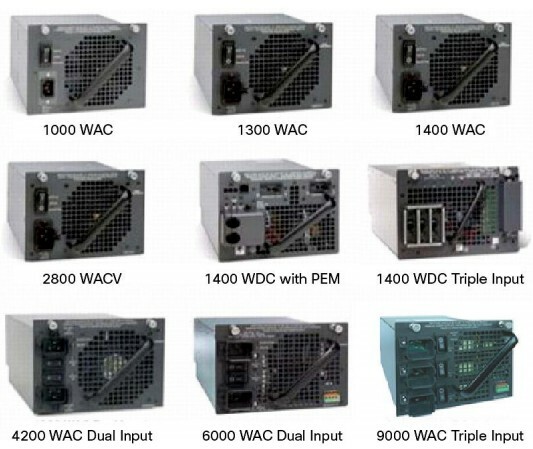 Do you know the types of the power supplies for Cisco 4500E Series? Can you find out your power supply for your Cisco Catalyst 4500-E series? No? Never mind. In this article, we will go to learn the main power supplies for Cisco 4500-E Series switches together. Hope it useful for you! Several AC power supplies the Cisco Catalyst 4500E Series provides: 1000W (data only), 1400W (data only), 1300W (data and PoE), 2800W (data and PoE), 4200W (data and PoE), 6000W (data and PoE), and 9000W (data and PoE). All Cisco Catalyst 4500 AC power supplies are single-phase and operate between 100 and 240 VAC. The Cisco Catalyst 4500E Series has two DC power options: one is optimized for data-only deployments in service provider central offices (part number PWR-C45-1400DC), and the other is used for high-power PoE deployments (PWR-C45-1400DC-P). All DC power supplies are designed to operate between -44 and -72 VDC. In any deployment scenario, whether AC or DC, the Cisco Catalyst 4500 Series has the power supplies and external power devices to meet customers’ power needs for data, voice, and video applications. In the following part we will introduce the each type of Catalyst 4500E Series power supply in details. There are three modes of operation supported by Cisco Catalyst 4500 Power Supplies. In all the modes the two power supplies need to be of equal wattage and type (AC/DC). In this mode the Cisco 4500 Chassis supports two power supplies, each fully capable of supporting the entire load of the switch. If one of the power supplies fails, the other power-supply unit in the chassis takes over the entire load without any downtime or discontinuity of operation while providing high availability and system resiliency. Thefailover is completely transparent. The Cisco Catalyst 4500 Chassis also supports N + 1 redundancy with N independent input circuits and safeguards against failure of one (+1) of the circuits as opposed to power supply unit failure. In this mode the power available for the entire chassis is equal to the sum of the output power of both of the power supplies times the share ratio. The 9000W ACV, 6000W ACV, and 4200W ACV power supplies can also be used in the N + 1 mode of operation in addition to the 1 + 1 and the combined mode of operation. The 9000W ACV power supply offers 5 + 1, whereas the 6000W ACV and 4200W ACV power supplies offer 3 + 1 redundancy. Note: The 6000W AC power supply also supports a true output power consumption monitoring capability. Both 9000W ACV and 6000W ACV power supplies have input and output power-monitoring capabilities. Both power supplies can provide not only the input AC power consumed by the switch but also the instantaneous power being used by the system. This setup enables provisioning of the optimal number of power circuits in the wiring closet and accurately size the back-up power (uninterruptible power supply [UPS]) for reduced infrastructure costs. In addition, both of these power supplies are equipped with remote power-cycling functions through a relay to shut downor power-cycle the switch for maintenance when there is no access to the console or switch command-line interface (CLI). This feature helps reduce overall maintenance cost of the switch (Figure 1). A three-position terminal block, located on the lower right quadrant of the power-supply faceplate, provides the interface to the external relay controller box. This section is applicable only to the power supply for data-only deployments in service provider central offices (PWR-C45-1400DC). The triple-input 1400-WDC power supply is optimized for service provider central-office deployments. By providing multiple inputs, the service provider DC power supply allows central-office technicians to customize the output power to meet their application needs. Many central-office deployments require only a fraction of the 1400W available in the service provider power supply. With low-current inputs, technicians can connect the supply to smaller fuses and breakers. The service provider power supply makes it possible to deploy a Cisco Catalyst 3-slot chassis with a single 15A circuit. Likewise, it is possible to deploy a fully populated Cisco Catalyst 10-slot chassis with one 15A and two 20A circuits rather than a single 60A connection, which often requires rack rewiring.